Here at Audi Midtown Toronto, we love a good luxury wagon. 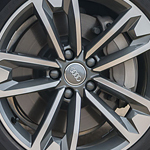 That's why we're such big fans of the Audi A4 allroad. This vehicle can do it all, while looking good and staying responsible. The A4 allroad combines sleek, rugged and efficient features to great effect. The A4 allroad has a lean, athletic look. This is a car that's ready for anything. It has a balanced stance, high enough to clear obstacles but low enough to enter and exit easily. The exterior design includes an innovative hands-free tailgate release. This feature can also close the door. Aesthetic options for the interior include ambient lighting. A panoramic sunroof comes standard with the A4 allroad. The interior of the Audi A4 allroad is stylish and comfortable, too. There are three distinct temperature zones inside the Audi car. There's plenty of legroom, too. We'd love to take you for a spin.